Notice the post dates above....in this thread....and the date of this post! #3 Wilmington Generators in Google. Full Ranking Report Attached as a PDF! This was released at the start of the summer...These are tough Keywords...but it is coming right along. I will get it there. All in due time. 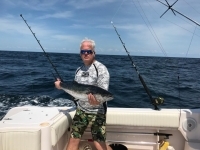 Dialed In Charters in Myrtle Beach SC.